Do you like watching dancing flames? Or listening to crackling fire? And what about that beautiful sensation of warmth? We must admit, fire evokes nostalgic and pleasant feelings. It is not surprising that even in 21st century we still enjoy sitting by fireplaces and wood burning stoves. Maybe even more than a few decades ago. We simply need that cozy, comforting ambiance. If you are thinking about bringing that very ambiance to your home, or you are looking for a great stove for outdoor use, we are here to help you make the right choice. Choosing the stove for its looks is easy. We all know what we like or dislike. But the efficiency and quality are not so easy to recognize. There are several things to know and consider. Up to 800 sq. ft.
1 Which Size is Right? 2 Small wood stove made of Cast Iron or Steel? 3 Is Smoke Emission Really Important for a tiny stove? Wood stoves are made small, medium or large. Small size stoves are great for small seasonal cottages. Or family rooms in homes that already have central furnaces. They are also suitable for cabins and boats. Beside extra heating, they will bring pleasant and welcoming atmosphere to your space. If you decide to buy a small stove, be careful how you use it. Heating spaces larger than approved by stove’s manufacturer may lead to its overheating and damaging, especially on cold winter days. For very small houses or cottages used in winter, as well as medium-sized rooms, a much better solution is the medium-sized stove. Their heat output is usually between 7kW and 10kW. Large stoves are suitable for large houses or older ones that do not have proper insulation. But choosing the largest stove on the market is not always the best solution. It may overheat your house or lose you money because of its wood consumption. It is far better to find the stove appropriate to your space. It will provide you a comfortable temperature at a low cost. How can you calculate the optimal heat output (kW) you need to make the space warm? Without unnecessary costs, of course. Simple enough. Divide the volume of your space (m3) with 10. The result is the optimal heat output for that space. The volume is the key factor, but weather conditions, size of windows, or insulation should also be considered. One more useful information, which you can usually find in specifications, is how many British thermal units (BTU) that particular stove generates. This information shows how efficient the stove is or how much heat it can produce. It usually takes approximately 30,000 BTUs to heat 1000 square feet. Small wood stove made of Cast Iron or Steel? Choosing the material of your future stove is not really an issue. You have only two choices – cast iron or steel. Cast iron stoves used to be very popular, while steel had a bad reputation. It was guilty of warping. Nowadays, steel quality has much improved. If high quality is at the top of your list, there is no need to worry about warping. Cast iron stoves can cause problems, too. If they are made of low-quality iron, they are prone to cracking. So, if you choose a high-quality product, it will serve you good, whether made of steel or iron. Bear in mind that cast iron needs more time to heat up. Thus, if heating your house fast is one of your priorities, steel stove is a better solution. Likewise, once the fire is extinguished, steel cools faster than iron. If you already know what kind of style you are looking for, choosing the material of your stove is much easier. You like traditional, rustic look? The cast iron stoves are perfect for you. They are made of molten metal poured into molds. That allows them to have lovely patterns and decorations. Steel ones are made of pressed steel sheets and thus have much cleaner lines. Their design style is usually modern, and they look great in sophisticated contemporary spaces. Is Smoke Emission Really Important for a tiny stove? If you haven’t thought about smoke emission, now is the time. Smoke that comes from burning wood contains many pollutants. It can be harmful to your environment and your health. Incomplete combustion is what’s causing it. Thus, the stove with less smoke emission has better combustion process. Better combustion process means more efficient heating. Previous generations of stoves used to release 15 to 30 grams of smoke per hour. Today, they are much more environment-friendly. Those of best quality produce a minimal amount of smoke and ash. According to EPA standards, wood stoves are only allowed to emit up to 4.5 grams of smoke per hour (g/h). In 2020, a new standard will take effect. The smoke will be limited to 2 grams per hour. Many modern stoves with advanced combustion technologies release between 1 to 4 grams. So, EPA certified stove is always a wise choice. Check product’s specifications or look for the EPA label on the stove. Two types of wood burning stoves meet the EPA standards – catalytic and non-catalytic. Most of the stoves available in the market are non-catalytic. They are much easier to operate and cheaper, thus more popular. They use secondary combustion air to burn off wood gasses before they leave the firebox. Three elements enable proper combustion. Those are firebox insulation, a large baffle, and high-level combustion air supply. The baffle and some other internal parts can deteriorate over the time and must be replaced. Catalytic stoves have coated ceramic honeycomb. That honeycomb becomes very hot, and when smoke passes over it, smoke gasses ignite, burning the waste and producing even more heat. Catalytic stoves generate long and stable heat. They must be adequately maintained and cleaned. The smoke they emit is transparent, so if you can see it, your stove is more than ready for cleaning. However, they require more experience and knowledge to operate properly. time. 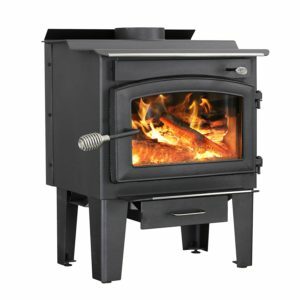 Even though its 18”x12” firebox is not very big, accepting only up to 17” long logs, it can heat up to 1,200 square feet. 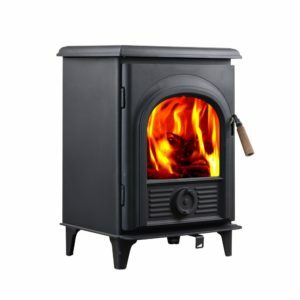 It has great EPA efficiency rating of 75%, and it can burn up to 8 hours on one fueling, depending on a type of wood you are using. What makes it so efficient? Full firebrick lining and stainless steel air tubes placed at the top of the firebox. Air tubes enable the stove to produce fire both at the bottom and the top of the firebox. When you lit up the fire, gases rise above the fire. Air tubes push fresh air into these gases causing secondary combustion. Besides increasing efficiency, these tubes also reduce emissions (4.22 g/hour). Clean burning makes it even more trustworthy. Its looks won’t knock you off your feet, but there is a real beauty in its simplicity. Charcoal black finish and the arched cast-iron door will undoubtedly add a rustic touch to your home. Nickel pewter trim is also a nice detail. One of its amazing features is 14.5” x 8” view window. It has air-washed ceramic glass that is surprisingly large considering the size of the stove! Nothing makes the ambiance so peaceful and cozy like a real wood-burning fire. This view window will allow you to enjoy it fully. There are two more great features. The ash hole with an ash pan at the bottom of the firebox which makes cleaning very easy. And adjustable legs, which are very helpful when positioning the stove and rarely seen on similar items. This simple multi-fuel wood stove is great for both indoor and outdoor use. Though very modest and unobtrusive in its appearance, its simplicity is very charming and likable. It can be a great addition to simple rustic spaces. It is a small 28” x 15” x 22” stove that can fit almost anywhere. Because of its size, it cannot be expected to be a primary heating source. Since its heating output is 7kW, it can easily add some additional heating to your space and, of course, a bit of nice atmosphere. Or even heat a medium-sized room. It is made of cast iron with the advanced furniture quality technique. Without a doubt, it will last long and serve you well. It is finished with black high-temperature resistance Us Forest paint. Cast iron door has a large window with the air-wash system for clean glass which is a great feature. This system is very efficient in keeping your glass clean and preventing tar to build up. You will be spared off tedious glass-cleaning work and just enjoy the view. This tiny wood stove is non-catalytic and has a very clean burning system. The amount of CO emission is extremely low, only 0.2%, which means its combustion is almost complete. The fire box is very small accepting only 15” long wood logs. It is lined with firebricks, and its overall efficiency is 68%. If you expected more, bear in mind that with proper usage and adequate wood, you will get the best out of it and be completely satisfied. Staying indifferent to this little stove is impossible. Even if you do not fall in love at first sight, you will eventually discover all its qualities and be amazed. Its beauty is serene, harmonious and unpretentious. Pure elegance, nothing showy or tacky. Just looking at it, even without burning fire, is pure satisfaction. And the best is yet to come. Its performances are stunning. HiFlame HF905U is non-catalytic EPA certified small wood burning stove. It is also OMNI tested, and Washington State certified. Like with any other non-catalytic stove, its burning system is very clean. And not only that. It features pre-heated tertiary air technology that can be found only in very expensive stoves. This technology enables almost complete combustion and excellent fuel efficiency. 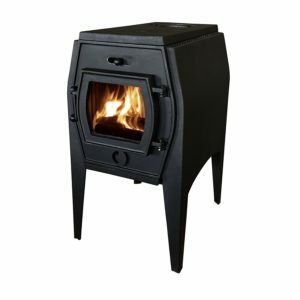 Even though its high-tech firebox is very small and can accept only small logs – up to 12” long – it can heat up to 800 square feet. Its overall efficiency is 85% when you use correctly aged wood. Tiny, but powerful stove. It also offers two 6” flue outlets, top and rear, which is very convenient. Made of cast iron with advanced furniture quality technique, it has a great rustic look. Its firebox is designed to prevent ash from coming out of the stove and keep the space around it as clean as possible. The beautiful arched iron door has air washed glass window. It provides an excellent view of burning flames without making you wonder how on earth you are going to clean that glass. Air-wash system will make it stay clean. This small stove will give you much more than just an efficient home heating. Put it in your living room, and it will create a warm and inviting space you will fully enjoy with your family or friends. Winnerwell Woodlander Cook Tent Stove is designed for nature lovers and adventurers. 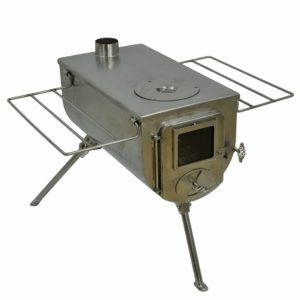 This small portable wood stove is very simple to use and easy to assemble. It is so exciting and practical that makes you wish you had one even though you are not planning any camping adventures. Great for outdoor cooking experience, but it can also be used in tents for heating. The size of its body is 18.9” x 9.8” x 9”. It is made of stainless steel and standing on three folding legs. The construction of the stove is solid and sturdy. The flue pipe is very long, and the height of this tiny stove with a flue is 90”. On each side of the stove, there is a grate that can be folded and used as carrying handle. All parts can be nicely nested inside the stove, so it is very practical and easy to transport. The griddle plate on the top is a cooking surface. Hotplate cover can be removed, and you can cook on an open fire. Preparing food for 4 to 8 people should not be a problem. Small steel door has one nice feature – glass window in the front. The possibility to see burning fire in such a small cooking stove is an amazing idea. Glass window could have been a great feature if it weren’t the weakest part of the stove. It can break up easily and gets dirty very fast. The size of the opening is 5.9” x 5.9”, and even though it is small, this stove can receive up to 18” long logs, which is very impressive. It is recommended to burn only dry wood because it provides clean burning and prevents creosote buildup. Flue pipes should be regularly cleaned. Woodlander Cook Tent Stove has a lot of additional accessories that can be bought separately – carrying bag, fireproof mat, spark arrestor, water tank that can be attached to the flue, tent protector. They all very conveniently fit inside the stove, and you have no problems carrying them around. All in all, this tiny wood stove promises adventure and lots of fun. When you see this tiny stove, you get excited because of its unique and remarkable design. 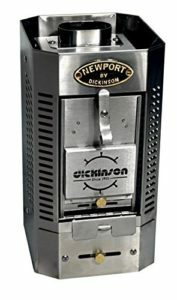 After all, Dickinson Marine is a worldwide famous brand name, and it has been producing high-quality marine stoves since 1932. This particular stove is designed for small boats and yachts, ideal for those 20 to 25 feet long. Very well adjusted to its purpose, this tiny stove has a superb and robust appearance. It will without any doubt draw attention. But it will also provide good heating and create relaxing and cozy ambiance. Although very small – 10” x 7.9” x 15.6” – its heat output is rather good; 8,000 BTUs per hour is enough to keep a small boat warm. It can also be installed in mobile homes and tiny cabins. Very well constructed, this stove is completely made of non-rust stainless steel. It is bulkhead mounted. Standard flue size is 3”, and stainless steel flue pipe must be at least 4 feet long. Nice laser cut door with printed Dickinson logo are closing a tiny firebox. Replaceable firebox liners are promising a long-time usage. Beneath the door, there is a removable ash-tray drawer with a dumper. It’s a convenient feature that enables fast and easy cleaning. Flame viewing grill is adjustable and creates a nice effect. You can choose from a variety of fuels – 1” thick wood, charcoal briquettes, stove pallets, peat. Driftwood should be avoided because the salt can slowly damage the heater and the liner. Engineering firewood is allowed as long as it is not BTU enhanced because it produces too much heat. Since it is made for small, closed spaces, it would be wise to think about the installation of permanent fresh air vent and CO detectors because of the carbon monoxide emission. This stove is robust, trustworthy and safe. Due to its impressive appearance, it can be an attractive addition to any boat or even mobile home.